Barbara’s son Abram, a twenty-year-old mechanic, is homosexual. In the small Bavarian village where he lives this cannot be hidden for long. Wherever Abram goes, he is abused and driven away. At the beginning he takes it calmly, but when Hannelore tells everyone that she is pregnant with Abram’s child, the situation escalates. 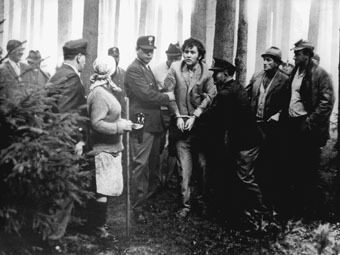 In a fit of rage, the young man strangles Hannelore and is consequently chased like an animal by the villagers. Peter Fleischmann was born in 1937 in Zweibruecken. He studied at the Deutsches Institut fuer Film und Fernsehen (DIFF) in Munich as well as at the Institut des Hautes Etudes Cinematographiques (IDHEC) in Paris. In 1969, he founded the production company Hallelujah Film together with Volker Schloendorff. Since 1992, he has been co-manager of the Babelsberg studios in Potsdam, Germany (former UFA/DEFA). A selection of his films includes: Hunting Scenes from Bavaria (Jagdszenen aus Niederbayern, 1969), Das Unheil (1972), Die Hamburger Krankheit (1979), Frevel (1983), Es ist nicht leicht ein Gott zu sein (1989) and Deutschland, Deutschland (1991).